During a visit Afghanistan in 1970 I met a delightful, gentle man from the town of Charikar, which is located about 50 kilometers north of Kabul in Parvan Province. Charikar was a picturesque village known for the knives made by its craftsmen. As is often the case in Afghanistan, Gulam’s surname was that of his home-town – Charikari. I’ve forgotten the events that led to our introduction, but Gulam was at the time the manager of a hotel in the Shar-I-Nau district of Kabul that had once been the Egyptian Embassy. The name of the hotel is lost to time. What I do recall is that I booked into the hotel and stayed there several times. The embassy/hotel had certainly seen better days. The rooms were sparse and the public areas furnished with rough wooden furniture and a few charpoys – a kind of rope-strung bed. The garden was pretty much a dust bowl. There were a couple of mulberry trees in the rear corner, numerous struggling rose bushes scattered about and the occasional patches of water-starved grass. At one point during the early months of 1972 the hotel became the hotel of choice for an overly large number of refugees of the Bangladesh/India war. One day a snake charmer paid us a visit with two cobras and a pocketful of scorpions to amaze guests and workers alike with his flute playing, fearless stunts and games of cups and balls. I volunteered to take part in a demonstration of how to put one of the scorpions into a harmless trance: this involved allowing the fakir to insert the stinger on the insect’s tail deep into the flesh of my palm while the gathered crowd of children and men watched as the critter waved its claws around while trying to get traction with its many legs. Soon the scorpion master released the stinger and put the beast back in its matchbox. I retreated unharmed to applause from the audience, thinking myself a kind of fakir! Parked pridefully, front and center in the garden of the hotel was a four-door Volga, the indestructible Russian automobile favored at the time by Kabul taxi drivers. In addition to being a hotelier, Gulam was also a motor wala – a driver. 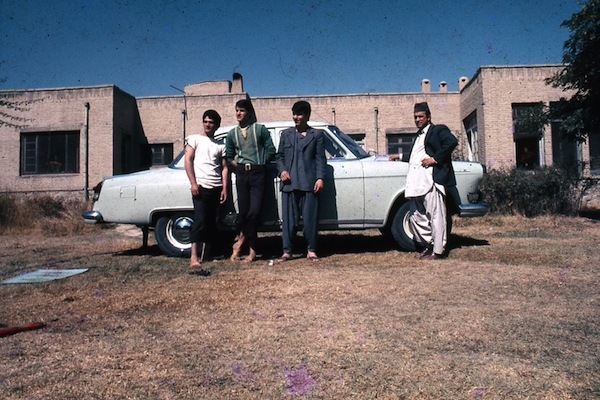 Gulam maintained the grey colored vehicle in spotless fashion, often taking it to a canal near the King Zaher Shah’s palace to throw bucket after bucket of brown-stained water over and into the car to wash away the inevitable Kabul dust, scrub the floor mats and seat and polish the rims and tires. A clean car would undoubtedly get more paying fares, no? 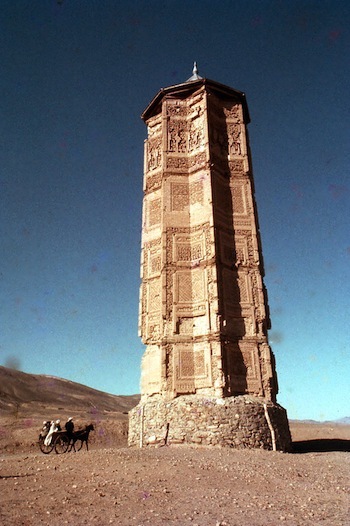 On a couple of occasions I hired Gulam and his shiny Volga for a road-trip – once, south to Ghazni to see the Ghaznavid minarets and ruins of the ancient city, another to Mazar-i-Sharif and Balkh with my girlfriend searching for oriental rugs and textiles. We traversed the famous Salang Pass and stopped in many chai khanas for tea, nan and kebabs. Gulam knew exactly where to pull over to find cool, clear fresh and drinkable water as it streamed from the rocks of an adjacent cliff. One time we even stopped to buy a bunch of Salang’s fabled fat brown trout to cook up in the hotel “kitchen”. Then one day I mentioned to Gulam I wanted to buy a car of my own and Ghulam mentioned he had a 1965 Volkswagen bus for sale. The price $200 US – “Sold” I exclaimed! The bus was in pretty good shape and in that car I drove with my friend Gary to the far corners of Afghanistan. To Balkh, Kunduz and Feydzabad, and beyond; the Kabul Gorge, Jalalabad, the Buddhist site at Hadda, to Peshawar to renew our visas and back to Afghanistan. When it came time to go back to the states, I sold the car back to Gulam for — $200 bucks and on a return visit bought it back for the same $200 bucks and then sold it back again on another trip. Best car rental outfit I ever found! And Gulam was ever agreeable and appreciative of the transactions. Memories of Gulam are among my fondest. He was the essence of a fine Afghan man: good-natured, fair and honest. I will always be pleased and grateful to have had him as a friend.